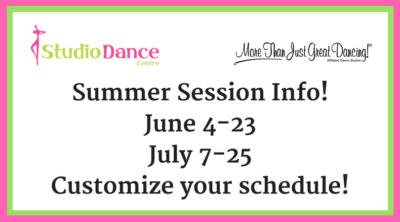 We are excited to announce that our Summer classes are open for registration! Click here to view our Summer Info flyers. You’ll notice that we’re offering two three-week sessions this year. Remember that you can always customize which weeks you’d like to participate in. Stay tuned for “pop-up summer camp” info too! We encourage ALL of our dancers to participate in at least three weeks of classes to maintain their progress. If you’re not sure which class is right for you child, please ask! We’re happy to guide you in the right direction.